This Find 5 Differences Picture Riddle is for Genius Minds who has very good visual power to observe things very carefully. 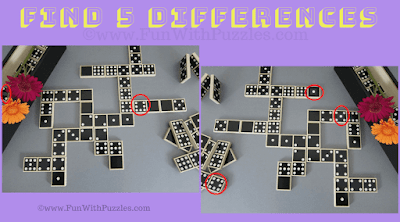 In this Picture Riddle, you are given two pictures taken from Dominoes Games. These two pictures are mirror reflection of each other. There are 5 differences in these two pictures. You are visually genius if you can find all 5 differences in these two pictures without looking at answer picture! 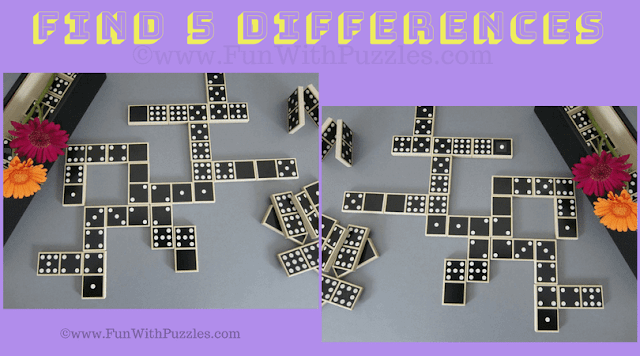 Answer of this "Find 5 Differences Picture Riddle", can be viewed by clicking on button. Please do give your best try before looking at the answer. Do checkout interesting puzzles and brain teasers which will help you to increase your brain power. Non Verbal Reasoning Test with Answers: These are very interesting Non Verbal Puzzles which will test your visual, observational skills and logical reasoning. Mathematical Reasoning Puzzles: These are Logical Reasoning Puzzle Question which will also test your Mathematical skills. 5 Challenging Brain Teasers For Adults With answers and Explanation: These are very interesting brain teasers in which your challenge is find the missing number in the circle. Quick Fun Brain Teasers with answers: At the end this is very interesting fun brain test in which your have to answer the puzzles quickly and correctly.